This year we are holding a number of artistic workshops across a variety of mediums, techniques and disciplines during the September / October School Holidays. 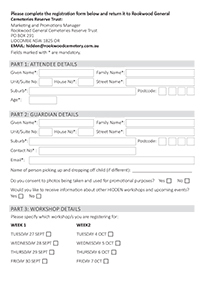 These workshops, which form a part of our annual sculpture exhibition, Hidden - A Rookwood Sculpture Walk, will give our younger audience the opportunity to create an artwork that focuses on themes around personalities, identities, characters and creatures. This year we will host workshops in The Cottage @ Rookwood Cemetery and at one of our partner venues, The Armory Theatre @ Sydney Olympic Park. Workshops will be split into two age groups (8–13 years and 11–16 years) and will run from 10am - 4pm each day. Please note: there are limited places so book early to avoid disappointment. For more information call us on (02) 8575 8100. Create a fantasy self-portrait inspired by the beauty of the garden. Working with Patrizia Biondi, you will develop a stylised image of yourself, set off by a highly decorative background surface. 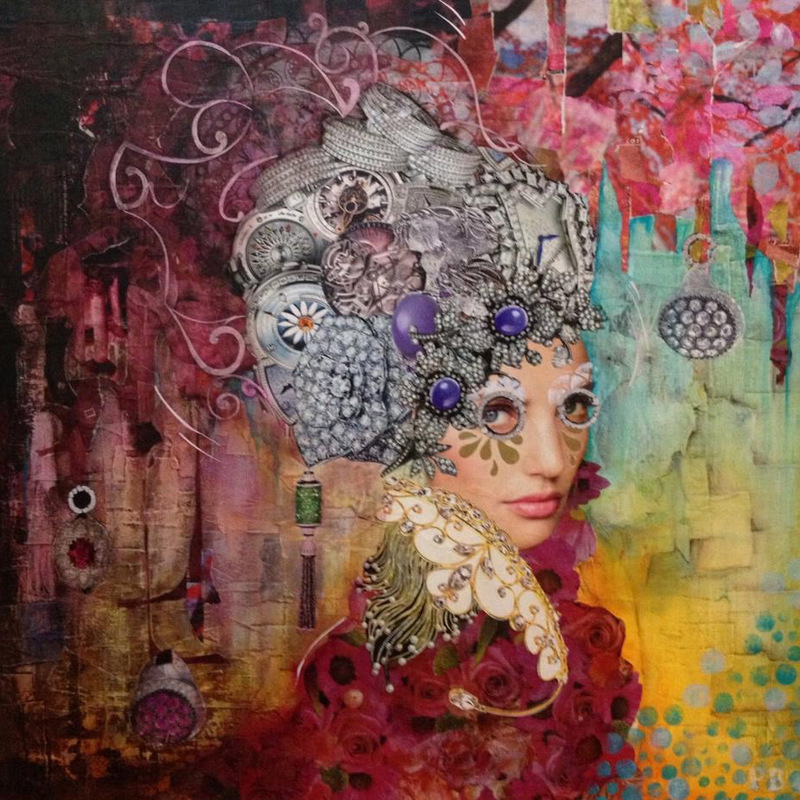 Exploring a wide range of collage materials, you will learn how to apply three-dimensional embellishment alongside two-dimensional collage, to create intense patterned surfaces. 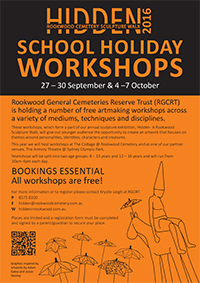 This workshop will take inspiration from the flora and fauna within Rookwood Cemetery. Explore the decorative power of birds, flowers, leaves and more. 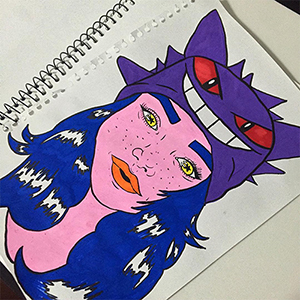 Explore your individuality through the bold and colourful techniques of Graff Art. 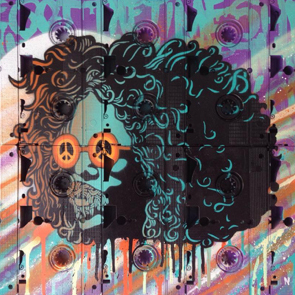 Working with Byron Bay street artist Nitsua, you will explore stencil art and freestyle spray painting. You will create personal images to build into stencilled and sprayed images plus learn techniques on cutting, can control and using different nibs. Get more out of your stencils by discovering reproduction and reprinting processes. Explore your future self through technology with Olev Muska. 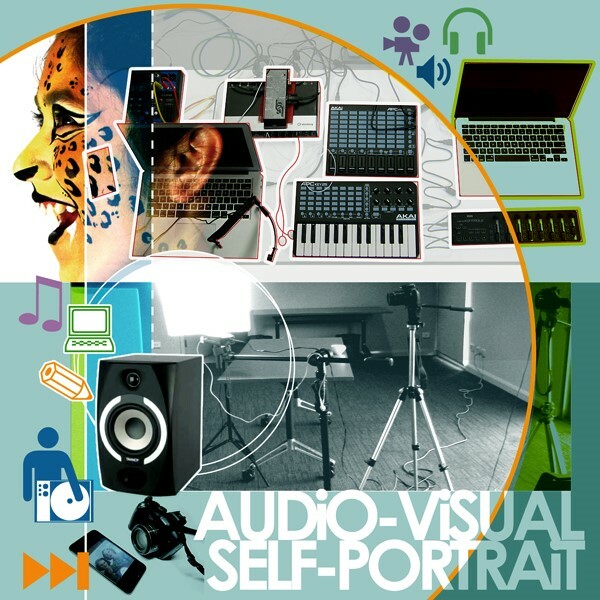 Using your face and voice as the subject, you will create an audio-visual self-portrait of you predicting the years to come. Play will become playback as you explore an assortment of computing, software, smart phones, tablets, apps, cameras and other recording and editing devices. Develop that accidental mini masterpiece for upload to YouTube. When you remember your own future, what are your enduring qualities? How will YOU see yourself? Create a lamp that tells a story. Working with Sydney based artist Madeleine Challender, construct a lamp out of transparency film, LED lights and batteries. Using a range of glass paints, pens and markers, you will decorate your lamp with images to illustrate a story that you will write on the day. Madeleine will teach you how to develop and illustrate a story exploring the theme of ‘The Future’. 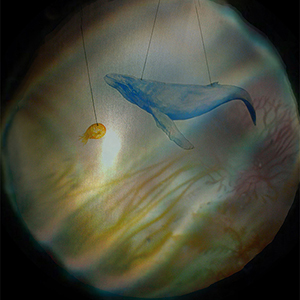 This workshop is inspired by Madeleine’s children’s book “Journey of the Light Explorer” and will be utilising the technologies and techniques that she used to make her book. Learn how to make a variety of animal forms made out of waste materials. 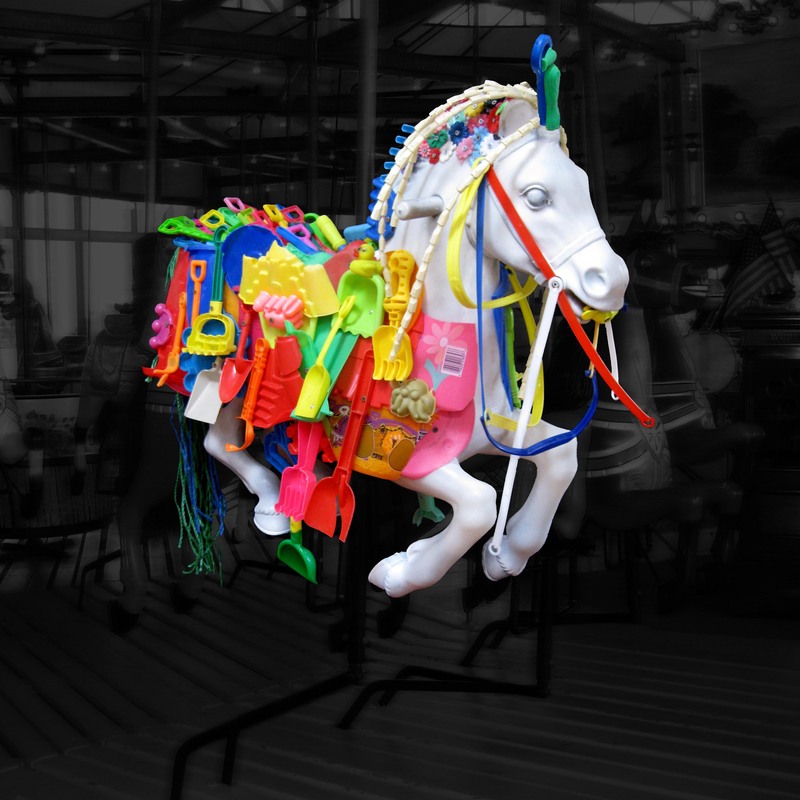 Working with Eco-Artist Marina DeBris, turn waste and recycled materials into your own invented animal hybrid. Be inspired by wildlife from the sea, sky and land. You will name your creature and write a brief description about its habitat and characteristics. How can your animal survive? This workshop will educate students about what kind of materials end up in the ocean and landfill. Bring along any recycled materials that you wish to get your animal started! 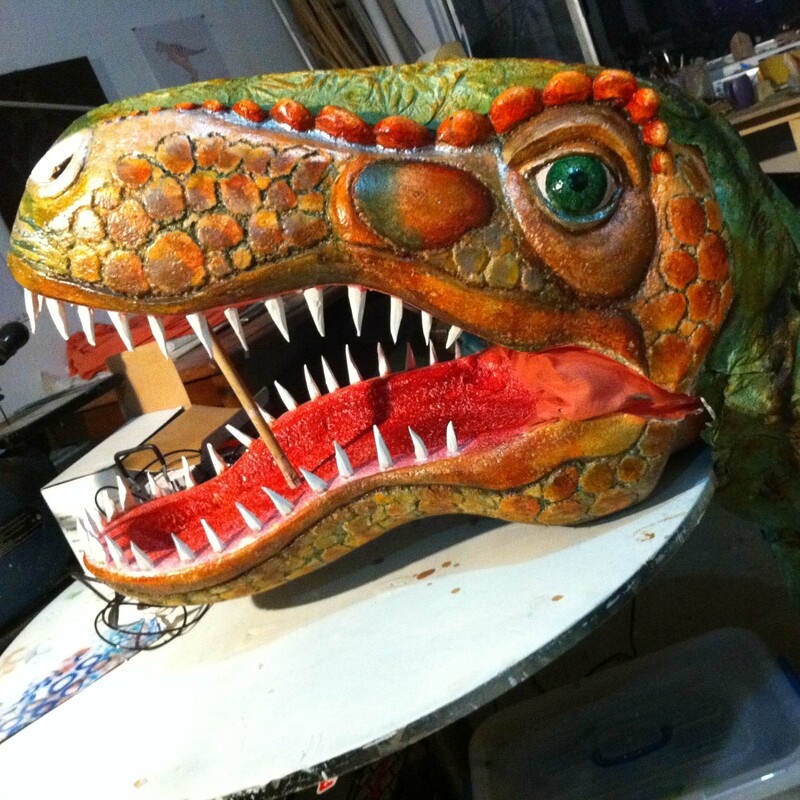 Create your own original creature puppet OR make your favourite character to puppeteer! Kassandra Bossell will show you how to devise your own monster through drawing and creating with a huge variety of fun materials. You will use soft foam to create the puppet’s basic shape and learn how to create turning and nodding mechanisms to animate your character. Use diverse materials, found objects and paint to create the character of the creature/ monster. Bring an image of the character you wish to make or create your own from a variety of inspiring examples. Remember, it will change as you make it! Join textile artist Sky Carter in a free-form weaving workshop, where you will learn how to make your own loom. 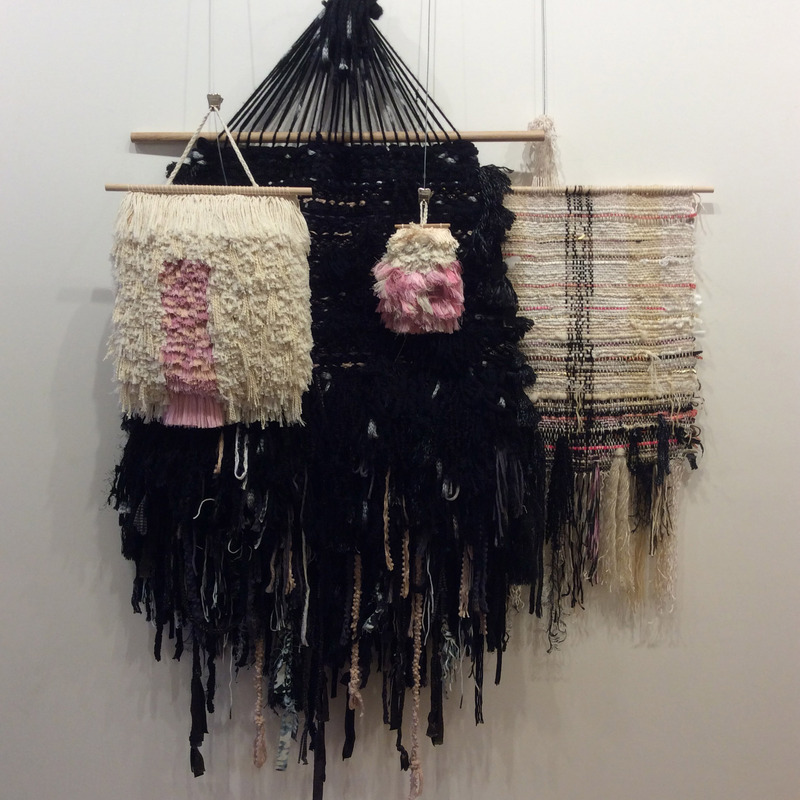 You will then create a wall hanging using a selection of materials such as fabric, yarn and string. Sky will help you express your inner creature using simple techniques to achieve a funky and fabulous woven masterpiece that is completely you. Learn how colour and materials can work together to explore visual texture. The techniques you will learn can be taken away and applied again and again. Allow your imagination to run wild in this cartoon inspired drawing workshop. Working with Illustrator Zuzu, learn how to draw and paint a range of slightly scary, but fun and comic characters. Creating images of aliens, monsters and machines, you will mix and match features to create new creatures. Learn how to work with the medium of Indian ink and fill your caricatures with a range of high chroma colour.